I don’t think anybody would be investing in hotels & airports if they thought that infrastructure would be flooded in the next 50 yrs let alone 7yrs. The best way the Maldives could reduce their contribution to increased CO2 in the atmosphere would be to close all the tourist resorts on their islands & refuse all international flights. 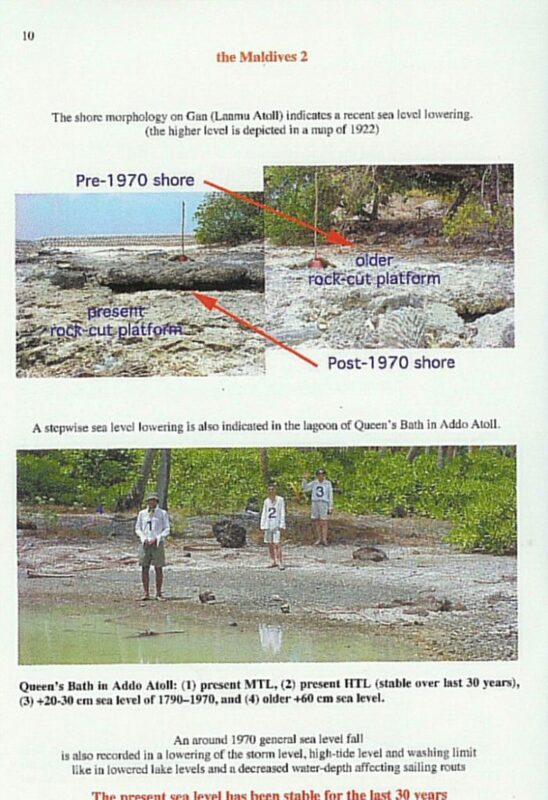 But no, they continue to build airports – http://www.haveeru.com.mv/news/63153 – because they live there & know how coral atolls really work. Maldives coralline atolls have been formed by the total reduction of a volcanic bed beneath the ocean. The volcanic bed roofed the same area the Maldives occupy at present. As the volcanic activity declined, the volcanic bed sank gradually. Eventually, the islands ended being submerged totally; nevertheless, the corals continued growing at their perimeters. The continued growth of these coralline reefs upwards (up to 80 mm per year), on the submerged volcanic bed gave rise to the formation of the Maldives coral atolls. But everything to do with sinking of a volcanic stack & coral growth.